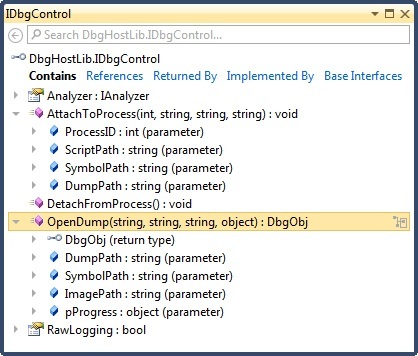 The previous post explained how to take advantage of DbgHost.exe, the debugging host provided by DebugDiag, to make a debugger engine load a dump file and execute commands like what you can do manually in WinDBG and the Immediate window of Visual Studio. The next step is to load well known extensions that we are usually use to diagnose problems from a dump file. If you are working with .NET applications, SOS is your friend. This extension provides many commands that help you understand what is going on in your managed applications. This .dll is installed with each version of the CLR under C:\Windows\Microsoft.NET\Framework. This is nice except when the dump you are trying to analyze comes from a system with a different version of the CLR runtime. In that case, there is no problem when trying to load the extension with the usual command line .loadby sos mscorwks/clr. So… What is exactly the issue? The sos.dll extensions relies on a private data access layer named mscordacwks.dll that must also be in the binary paths of the symbol store. As a reminder, this piece of information is given as parameter to DbgControl.OpenDump(). So… When the debugging engine tries to find the mscordacwks.dll, it looks for what exists in the symbol store; first in the local one (c:\symbols in my example) and if not there, in the http-based one (http://msdl.microsoft.com/download/symbols in my example). As mentionned in the error message, you can use .cordll -ve -u -l to force a reload through the symbol engine. shows that the installed version does not match the version expected from the dump file. In the previous post, I’ve introduced a tool that helps finding managed memory leaks based on output obtained via WinDBG and the SOS extension. Even though the clipboard interception makes the process easier and faster, it is still boring to open dumps in WinDBG, then load sos before copying the output of !dumpheap -stat. 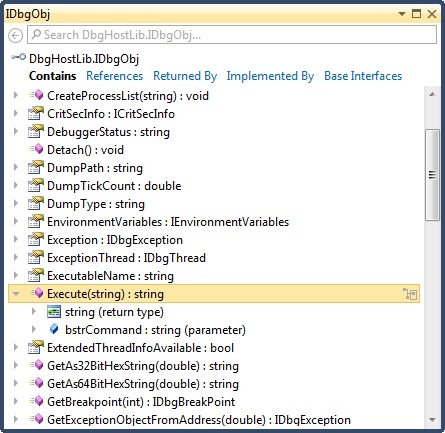 It would be great if all this could be automated: this post will quickly present one way to write code that controls the debugging engine instead of manually dealing with WinDBG. In addition to MSDN Magazine, John detailed part of the dbghelp API in one of his books. But most of the API was related to symbol management and things have changed a little since that time. When you take a look at the include files, DbgEng.h contains 16.000+ lines and DbgHelp.h has more than 4.500 lines. The former defines a long list of COM interfaces with IDebugClient.OpenDumpFile to open a dump file. The latter allows you to access the different streams (defined in MINIDUMP_STREAM_TYPE) of a dump file with MiniDumpReadDumpStream() once it has been mapped into memory as a memory mapped files. Since I want to access to a dump file in managed code, load extensions and send commands to be parsed, these two APIs are way too complicated for what I have in mind. CodePlex also provides two wrappers and a PowerShell interface for the debugger engine API but I’ve found another solution. As stated on the download page, “the Debug Diagnostic Tool (DebugDiag) is designed to assist in troubleshooting issues such as hangs, slow performance, memory leaks or fragmentation, and crashes in any user-mode process. The tool includes additional debugging scripts focused on Internet Information Services (IIS) applications, web data access components, COM+ and related Microsoft technologies”. 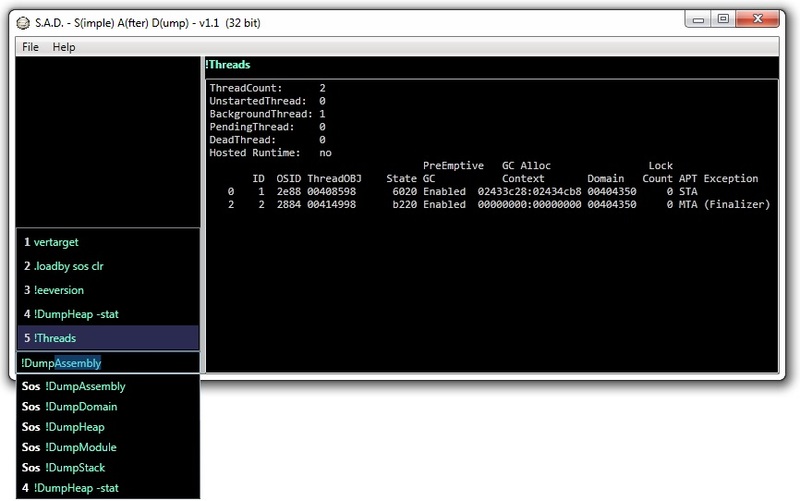 Even better, “the Debugger Host (DbgHost.exe) hosts the Windows Symbolic Debugger Engine (dbgeng.dll) to attach to processes and generate memory dumps. It also hosts the main analyzer module to analyze memory dumps” and exposes high level services as a COM server. Note that beta 2 version of DebugDiag is also available for x86 and x64. But what do we get exactly? SymbolPath: you give the symbol store path so the engine will find the .pdb files for the loaded modules. 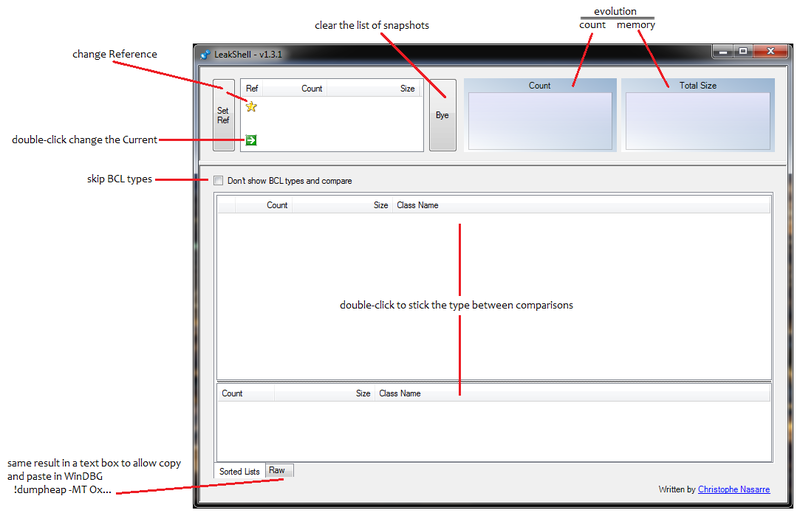 ImagePath: you give the symbol store path so the engine will find the loaded .dlls when needed. If you are working with WinDBG, you already know how the symbol store is important. Otherwise… well… read Advanced .NET Debugging by Mario Hewardt and Patrick Dussud. You will see in a forthcoming post how important the symbol store is when dealing with the sos.dll extension. Once a dump file is loaded by the debugging engine, you access it through the IDbgObj interface returned by IDbgControl.OpenDumpFile(). The Execute method takes the command to run as a string and returns the result as a string too. It is easy to write a couple of lines that load a dump file and get a few details about it. In addition to the two already described methods, the following code shows how to use other IDbgObj properties. As you can see in the result, the OSVersion does not seem to be meaningful. Interestingly enough, you are able to figure out if a dump is 32 bit or 64 bit by parsing the first line of the “vertarget” command result: “x86” for 32 bit and “x64” for 64 bit. It is very important because you should always use the 32 bit version of the debugging engine to work with a 32 bit dump. Same rule for a 64 bit dump: always use the 64 bit version of the engine in that case. The solution I’ve chosen is to compile two versions of my application: one for x86 and the other for x64. Each one checks that the dump to load has the expected bitness. The next post will discuss the issues related to using the sos.dll extension. I’m assuming that the notion of memory leak in .NET is clear but if it is not, you should read Identify And Prevent Memory Leaks In Managed Code by James Kovacs and the recap of GC behaviors by Jeffrey Richter in Part 1 and Part2. When a memory leak has been identified through TaskManager, PerfMon, ProcessExplorer, System.Diagnostics.Process.PrivateMemorySize64 or System.OutOfMemoryException, it is time to find out what instances are still referenced while they should not and by which object(s). This post focuses on the first part of the investigation : what instances are stuck in gen2 part of the managed memory. I’ve used one of the leaks examples given in Finding Memory Leaks in WPF-based applications to write an application where objects are still referenced even one might think they are not. As you might guess, when a StickyEventsWindow gets closed, it stays in memory due to incorrect event registration. Rico Mariani provides a simple and efficient way of Tracking down managed memory leaks (how to find a GC leak). The idea is to use sos.dll and a debugger to list the objects managed by the GC. When you investigate a memory leak, you are either lucky enough to reproduce it in your developpement environment or on production machines far far away. In the former case, you can attach your debugger to the application. In the latter case, you’ll ask the administrator to capture dumps of the application. For more details about the 666 ways to take a minidump, take a look at How to Capture a Minidump: Let Me Count the Ways by John Robbins. At that point, we have the state of the application in term of allocated objects. We need to wait for more objects to be created an take another !dumpheap -stat snapshot but with leaked objects. sort the columns by MTNote that it is possible to have instances of the same ClassName for two reasons: same type in different AppDomain and differents types from different assemblies. Only the Method Table address is the key to distinguish CLR types. I decided to build a tool to compute these steps for me and voila: LeakShell was born. It automatically intercepts the copy to clipboard in text format that contains “!dumpheap -stat”, sort it by MT and add it into a collection of snapshops that you can compare one against the other. Once you’ve identified the types of the objects with a count that keeps on increasing, it is time to take a look at your code. Well… you can also keep on investigating with sos.gcroot but it is a nightmare even if you use John Robbins trick to jump from address to address with a mouse click. !TraverseHeap writes out a file in a format understood by the CLR Profiler. Read NET Best Practice No: 1:- Detecting High Memory consuming functions in .NET code by Shivprasad koirala for more details about how to use the CLR Profiler. Please feel free to post your comments about how to improve LeakShell. 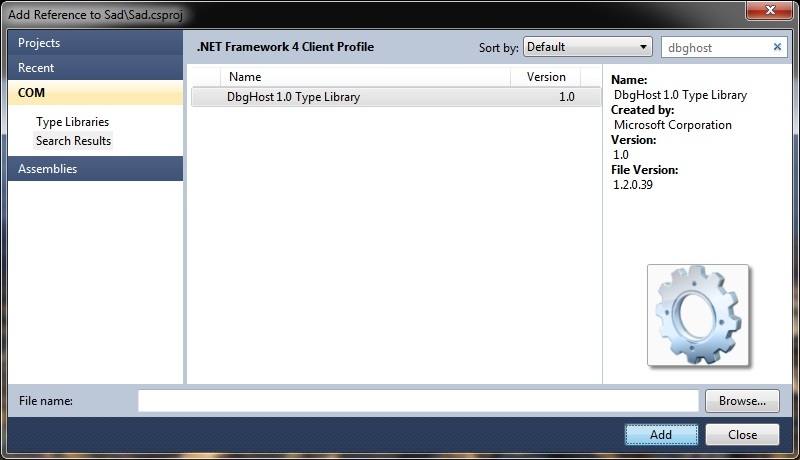 Inspect and Optimize Your Program’s Memory Usage with the .NET Profiler API by Jay Hilyard. Best Practices No 5: – Detecting .NET application memory leaks. Investigating Memory Issues by Claudio Caldato and Maoni Stephens. Memory Leak Detection in .NET shows how, thanks to sos.dll commands, to detect leaks but also how track down what objects are keeping a reference to another object. Last but not least on MSDN.